Elek. Hardcover. POOR. Noticeably used book. Heavy wear to cover. Pages contain marginal notes, underlining, and or highlighting. Possible ex library copy, with all the markings/stickers of that library. Accessories such as CD, codes, toys, and dust jackets may not be included. Elek, 1973. Hardcover. Good. Disclaimer:A copy that has been read, but remains in clean condition. All pages are intact, and the cover is intact. The spine may show signs of wear. Pages can include limited notes and highlighting, and the copy can include previous owner inscriptions. At ThriftBooks, our motto is: Read More, Spend Less.Dust jacket quality is not guaranteed. Elek. Hardcover. 0236154613 Crisp pages. Tight binding. Light shelf wear on dust jacket. . Very Good. 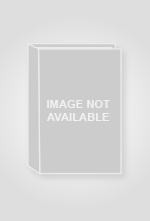 Elek (Paul) (Scientific Books) L. Hardcover. Used; Good. Elek. Hardcover. 0236154613 Book is in good condition with typical reading wear to cover and spine. Pages are yelllowing. Fingermarks maybe present. -- Re-Read is a social enterprise that trades in and recycles books to reduce waste, save them from landfill and provide services and activities that promote literacy, education attainment and quality of life in South Yorkshire and supports Askern Community Library. All overseas shipping is via Airmail. . Good. 1973. Elek. Used - Very Good. Hardcover w / dustjacket. Very good condition; edges, corners, and covers of book show minor wear. No underlining; no highlighting; no internal markings. DJ is Very Good and covered in DEMCO. Stored in sealed plastic protection. In the event of a problem we guarantee full refund. 1973. Hardcover w / dustjacket. London: Elek Books. Hardcover. 1973. 1st English Ed. 8vo 223pp . Fine in Fine DJ. B&W Illustrations Little cocked, DJ chipped Story of 5 people who were set adrift in a rubber raft after their boat sank . HarperCollins Distribution Services. Hardcover. 0236154613 . Good. UK: Elek Books. Very Good in Very Good dust jacket. 1973. First Edition. Hard Cover. 0236154613 . 223 pages. After drifting for 37 days in the Pacific Ocean in a raft and dinghy this family was rescued. This is a detailed account of their survival. Dustjacket intact, colour maps on endpapers show the family's route. Fourth impresssion; B&W Illustrations; 8vo 8" - 9" tall; 224 pages . London: Elek, 1973. Minor creasing to edges of unclipped dustwrapper, minor bumping to spine ends and corners of blue boards, otherwise a good clean tight copy of this hard-cover book. 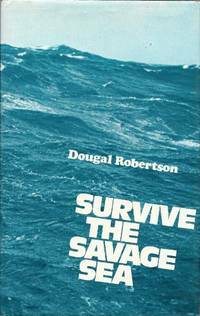 The author's account of his family's experiences when their 43 foot schooner "Lucette" was sunk off the Galapagos Islands by Killer Whales in June 1972. The family (the author, his wife and three sons, and a student friend) spent 37 days in a small dinghy with minimal supplies, and were rescued by a Japanese fishing boar and taken ashore in Panama. 223pp, b&w illustrations and drawings, endpaper map.. First Edition. Hard Cover. Good/Good. 8vo - over 7¾" - 9¾" tall. London: Elek, 1973. Hardcover, met stofomslag, 22 x 14 cm, 223 pp. Ills. : black and white illustrations. On how a family of five and their friend survived a shipwreck after an attack by killerwhales.. Cond. : goed / good ISBN: 0236154613. . Published by Elek Books Ltd., 54-58 Caledonian Road, London First Edition 1973. London 1973., 1973. First edition hard back binding in publisher's original blue paper covers, gilt title and author lettering to the spine, colour end paper maps. 8vo. 8½'' x 5½''. ISBN 0236154613. Contains 223 printed pages of text with monochrome photographs and illustrations throughout. Ownership marking to the title page. 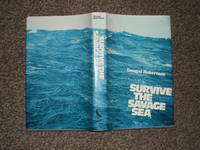 Very Good condition book, in near Fine condition dust wrapper, not price clipped. Dust wrapper supplied in archive acetate film protection, this protects and prolongs the life of the paper, it is not adhered to the book or to the dust wrapper. Member of the P.B.F.A. 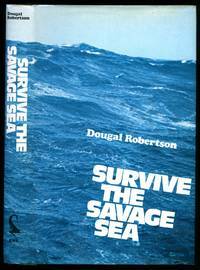 Published by Elek Books Ltd., 54-58 Caledonian Road, London First Edition 1973. London 1973., 1973. First edition hard back binding in publisher's original blue paper covers, gilt title and author lettering to the spine, colour end paper maps. 8vo. 8½'' x 5½''. ISBN 0236154613. Contains 223 printed pages of text with monochrome photographs and illustrations throughout. Fine condition book, in Fine condition price clipped dust wrapper. Dust wrapper supplied in archive acetate film protection, this protects and prolongs the life of the paper, it is not adhered to the book or to the dust wrapper. Member of the P.B.F.A.